Jodie graduated with a Bachelor of Occupational Therapy in 2009 and has been a practicing Occupational Therapist since 2010. Jodie has been working with the Upper Limb for the entirety of her career, however commenced work in the Hand Therapy speciality in 2012 and has continued this passion since, working alongside Orthopaedic surgeons and General Practioners, both privately and publicly to achieve the best possible Hand and Upper Limb outcomes for her clients. Her skills also include acute and rehabilitative care in tertiary hospitals and non-for-profit sectors with a focus on adult/paediatric orthopaedic and neurological upper limb rehabilitation. 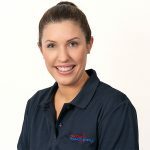 Jodie has recently relocated to Canberra from Brisbane with her family and is skilled in all aspects of assessment and treatment at the elbow, wrist, hand and fingers including wound care, casting, static and dynamic splinting, oedema and scar management. She has special interests in multi trauma, sports injuries and mobilisation of stiff joints. Jodie believes the best tools we have access to as therapists are a client-centred approach, creativity and innovation.